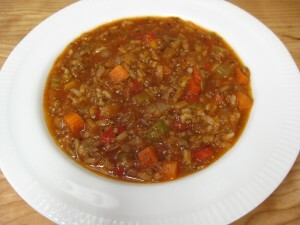 Vegetable Beef Soup used to be a favourite soup at one of the very popular family restaurant chains while I was growing up. This recipe is adapted from one which came from a friend of my mother’s many years ago. It has been tweaked slightly including the addition of my favourite red peppers. I also substitute V8 juice for the tomato juice for a richer, more complex flavour. After using Italian canned tomatoes one time (bought by mistake), I now add just a touch of Italian herbs to the soup. Hot sauce is optional. I suppose you could also use a pinch of red pepper flakes is you like that touch of heat. Very low fat and full of vegetables, this is a complete meal is a bowl. Add your favourite bread or buns and dinner is served!! 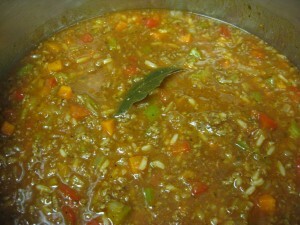 In large heavy bottomed pot, brown ground beef, stirring constantly to break up well. Add onion, red pepper, celery and carrots and continue to cook over medium high heat until onion is translucent and tender. Spoon off any excess fat. Put tomatoes in food processor or blender and blend – this step is optional. Add to pot along with remaining ingredients. Bring to a boil, then lower heat to a bare simmer and simmer for at least 1 hour (up to 2 hours) covered, stirring occasionally. Remove bay leaves before serving. If soup is too thick when reheating, add a bit more V8 or some beef stock. 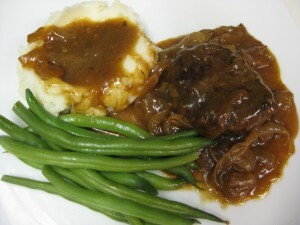 A favourite dinner in our family, Devilled Salisbury Steak is another great comfort food. Being inexpensive and relatively easy to make are bonuses too! 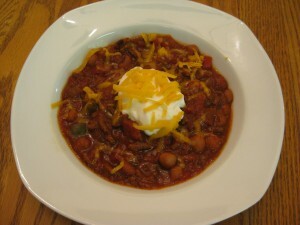 This recipe has been adapted from one found in the newspaper years ago – tweaked to our tastes. The combination of brown sugar, mustard, and steak sauce may seem unusual but it is delicious – try it and see. Mix above ingredients and shape meat into 6 flat oval patties. Brown patties in small amount of oil in frying pan over quite high heat to brown well – you do not need to cook them completely. 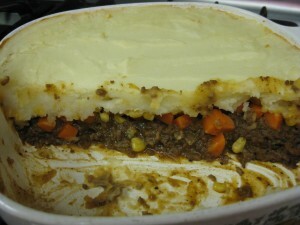 Remove to a casserole dish which just holds the patties – a 7 X 11 glass pan works well. Add onions to frying pan and saute until softened as much as you like – they do not soften much more when cooked in the sauce. I like them almost caramelized – cooked over a medium to low heat for about 15 – 20 minutes. Spread onions over patties. Mix beef broth with remaining ingredients and add to skillet. Bring to a boil. Pour over patties and bake in oven (uncovered) for about 30 minutes. Serve with mashed potatoes. Note: The onions in this recipe are delicious and almost a side dish in themselves. I use 2 or 3 onions – kids can easily remove them. With its rich gravy and tender, falling apart meat, pot roast is a wonderful comfort meal especially in the winter months of dreary weather. It is also very easy to do with your slow cooker. The most important ingredient is, of course, the beef roast itself. It is actually the most inexpensive roasts, like a chuck or cross rib, that produce the most meltingly tender meat because of the marbling in the meat. Any fat can be cut away and skimmed from the juices before thickening the gravy. 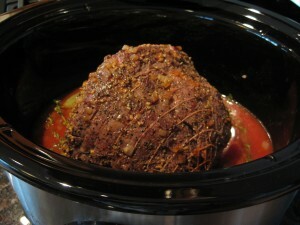 Too tender a roast does not pot roast well – it becomes too dry. 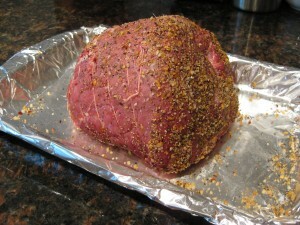 The roast in the picture is an inside round roast which contains much less fat and is considered a medium tender cut. It made a delicious roast but this type of roast cannot be overcooked or it will go too dry. It is done when a meat fork goes in and out of the meat easily. Sorry, I didn’t take it’s temperature but I will next time and let you know. If the meat does get too dry, simply slice it, put it back in the gravy and let simmer gently for a few minutes. Leftovers stored with the gravy poured over will be even better the next day. 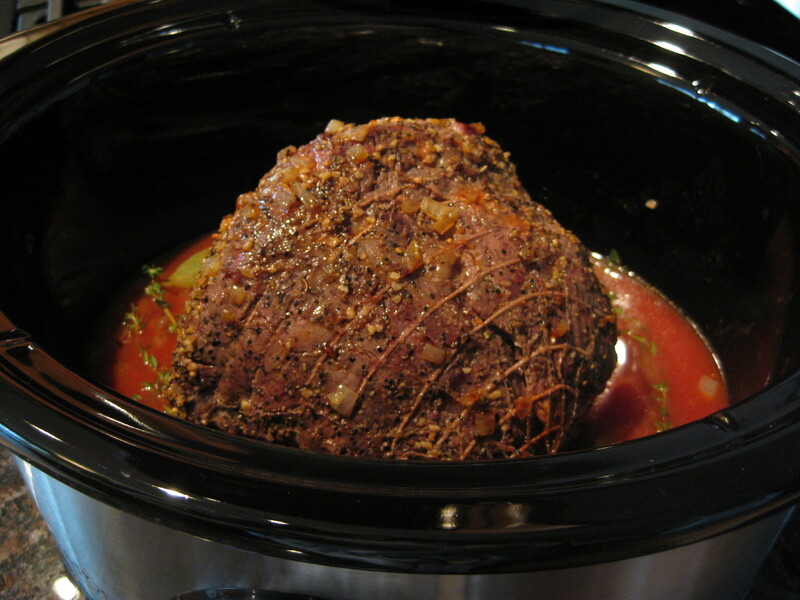 Re slicing the roast, removing the roast from the liquids, covering it to prevent drying out and letting it sit for at least 20 minutes helps to create neater slices of pot roast. The round roast will slice the most neatly. I suspect that the perfect slices you might see in pictures are a result of cooling the meat completely before cutting. 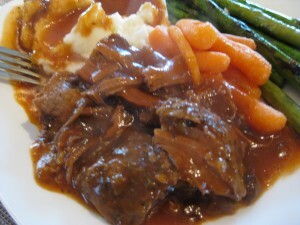 The most delicious pot roast may simply fall into succulent chunks when you try to cut it – that’s not a fault!! 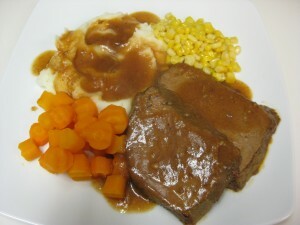 Enjoy this roast with the deliciously rich gravy and mashed potatoes! !